We are now down to 110 players and in the money. All players are guaranteed at least $616. 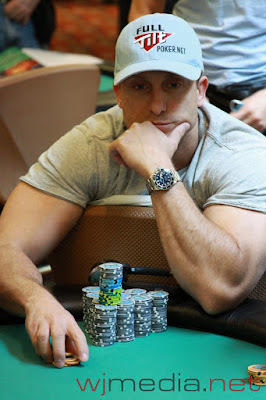 James Woods raises to 25,000 before the flop and Mike Dentale makes the call. The flop comes nine high and Woods moves all-in, having Dentale covered. Dentale makes the call with pocket nines and Woods turns up pocket kings. Dentale looks to have a lock on the hand until Woods spikes a king on the turn for a better set. The river was a blank and Woods won the pot, sending Dentale to rail just short of the money. James Woods in now up to 370,000 with only 144 players remaining. With 189 players remaining, the average stack is now just over 84,000. Play has resumed after the dinner break with less than 250 players remaining in the $300 Mega Stack Challenge. The players in the $300 Mega Stack Challenge event are now on a one-hour dinner break. With 260 players remaining, the average chip stack is just over 61,000. On the first hand after the break. Mike Dentale took down a big pot and now sit above 150,000 in chips on Day 1 of the $300 Mega Stack Challenge. Actor/director James Woods has chipped up on Day 1 of the $300 Mega Stack and has 117,000 with the chip average at about 45,000. The 352 remaining players in the $300 Mega Stack Challenge are now on a 10-minute break. The blinds are being increased to 1,000-2,000 with a 300 ante and the average chip stack is now just over 45,000. 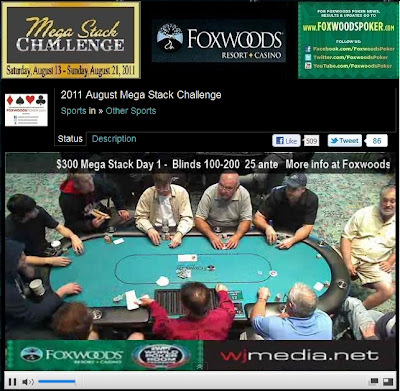 The players in the $300 Mega Stack Challenge event are currently on a 15-minute break. With 650 players remaining, the average chip stack is now approximately 24,500. We had a total of 1,063 players in the $300 NLHE Mega Stack Challenge event. Day 1 of the $300 Mega Stack Streaming Live! 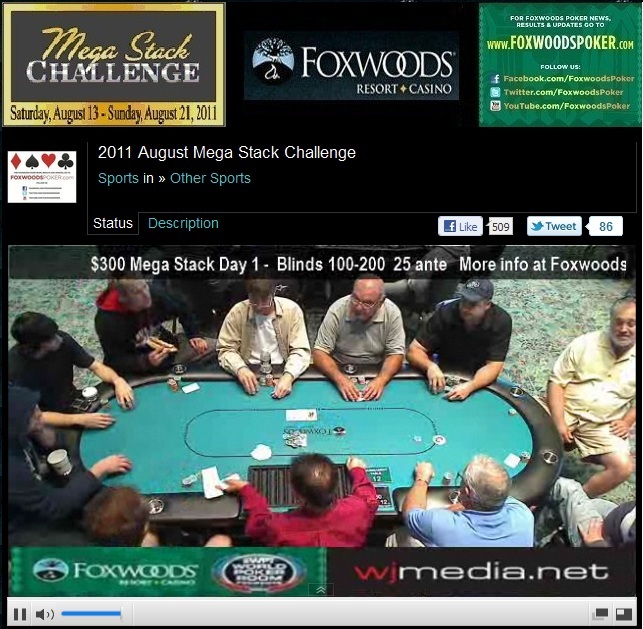 The feature table on Day 1 of the $300 Mega Stack Challenge is now streaming live. Just click "Watch LIVE Video" at the top of the page to view the live stream! There are currently 15 minutes remaining in Level 4 of the $300 Mega Stack Challenge. There is a break after this level and registration will remaining open through the break. The clock is now showing 1,059 players registered for today's event. With registration still open, there are now over 1,000 players already seated in today's field. After a short delay, the $130,000 Guaranteed $300 No-Limit Hold 'em event is now underway. Players start with 15,000 in chips and the blinds are currently 25-50. There are over 850 players currently in today's field with registration open for at least the first two levels.